We had to buy one of these too. It's called a Pivit and it worked great. One coat down, one to go. Here's a sad attempt to make these ugly curtain rod finials not-so-ugly. Yes, they're not green any more but no, they're not any prettier. Here I am trying to hide the fact that I got white paint onto my black sweater. Sharpies come in handy for so many different reasons. 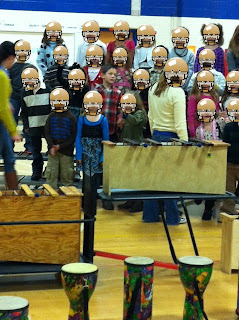 Last week Vance had his school musical debut. Each student was equipped with 2 wooden sticks (to play with one of the songs) and there was never any sword fighting or head bonking. Way to go first grade teachers! I'm sure that's a first grade miracle! Here's Vaughn warming up her tapity-tap shoes before class the other day. why did you block the kids faces out? Lawsuit? I don't like it when people post pictures of my kids without asking. I'm sure other parents feel the same.